The number of international college students surged to a record number last year as American schools increasingly value the tuition dollars they bring. Full-pay foreign students are “cash cows”. The proliferation reflects continued aggressive recruiting by U.S. schools, which see full-pay foreign students as cash cows at a time of decreasing public subsidies, flattening tuitions and a falling number of U.S. high-school seniors. About two-thirds of international students in the U.S. pay their own way, and most aren’t eligible for U.S. government aid programs. Many colleges charge them additional fees. Look for more increases in coming years. 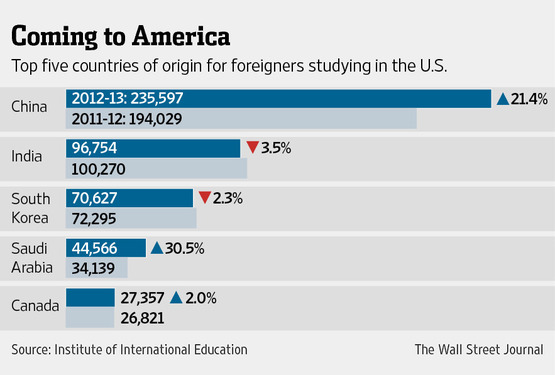 In addition to tuition dollars, foreign students also add diversity. This double bonus has prompted many colleges to recruit aggressively from other countries. Students do not come to the United States to study liberal arts. “Full fare bodies versus discounted bodies.” The complaint that international students are taking up slots that should be going to U.S. residents must be balanced against the benefit of foreign dollars that subsidize the education of students paying discounted tuition.